The 38′ Morecambe bay prawner “Polly” had left Rhyl harbour early on the morning, bound for Conwy marina, it’s original destination when Rhyl Lifeboat towed her in in November 2003. The crew were already at the boathouse for a normal Sunday morning and were keeping an eye on the boat. It was noticed that she had gone out about 4 miles, and then seemed to stop and drift erratically with the tide and wind. The coastguard at Holyhead were advised and they contacted the skipper by radio. He said he was having difficulty with the engine, and so the ILB was requested to launch. This was done within 5 minutes, and the ILB was alongside in 15 minutes. A tow was commenced, but this was found to be difficult due to the sea and tidal conditions, and so the launch of the AWB was requested. The AWB was alongside by 11.45 and the tow handed over by 12.00. The ILB was freed to return to station by 12.30.See AWB report for fuller details. ILB crew paged to assist North Wales Police recover a body from the water off Garford road, at the East end of Rhyl Promenade. When the ILB arrived on scene, the body was at the water’s edge, with the North Wales Police Helicopter (NW1) hovering overhead. The ILB crew then assisted police officers in recovering the body back to the promenade, and then the ILB returned to station by 1640. ILB crew paged together with Rhyl coastguard to assist a person walking on the beach at Talacre, about 5 miles East of the station, who had become disorientated and could not find his way back to the car. After the tragic events of last week at Morecambe; where 16 cocklers lost their lives when they were overtaken by the incoming tide, the Coastguard at Holyhead immediately requested Lifeboat and Coastguard assistance. The ILB was launched within 4 minutes, and had got as far as the Rhyl/Prestatyn boundary when the coastguard reported the man had rung on his mobile to say he was now safe. All units were stood down, and the ILB was rehoused at 2305. The ILB was launched at 1245 Holyhead coastguard received numerous 999 calls reporting that a small dinghy with a man and 2 children on board had capsized at the entrance to Rhyl harbour. None of the people were wearing lifejackets and they had no safety equipment on board. The boat was on scene within 6 minutes, but the casualties had managed to scramble ashore on the Kinmel bay side of the river. The casualties were met by the local coastguard unit and were transferred to an ambulance as the children were hypothermic. The Inshore Lifeboat then managed to get the dinghy in tow and took it back to the Yacht club slipway at Rhyl. The occupants of the boat were in a very small dinghy which was overloaded, and it no doubt capsized due to the rough water at the harbour entrance. The 3 were very lucky that the capsize was seen by people at the yacht club, and so the rescue services were immediately notified. ILB launched to assist 3 people on a speedboat “Gemill” off Llysfaen, Colwyn Bay, after their outboard motor had failed. the ILB managed to get a tow line on , but it was too much for the ILB, and so the AWB was also launched. The ALB took over the tow, and took the boat and it’s crew to Rhos-on-sea. the ILB was released and returned to station by 1630. ILB taken by road towed by the Landrover to the harbour, where there was a report of two youths in a dinghy being swept up river by the tide. The ILB launched in the harbour and found the dinghy with no one on board, but two youths were seen on the bank running away. the ILB crew recovered the dinghy back to a mooring in the harbour and returned to station by 2115. ILB launched to assist ambulance personnel at Prestatyn where a woman was threatening suicide and running in the water. the boat had only gone about half a mile when the Coastguard reported the woman was out of the water and in the hands of the ambulance crew. The ILB was released and returned to station by 2015. ILB launched to same report as last night of youths in a dinghy between the two bridges in Rhyl harbour. The ILB found two dinghies and returned them to the fishing boat moorings, then commenced a search of the river banks together with local Coastguard units and the Police helicopter NW1. Four youths were apprehended by the shore crew in the Landrover and were transferred to local police officers who arrested the four. They all admitted they were the same youths who had been in the dinghy the previous evening. The rescue units were released and the ILB returned to station by 2245. Holyhead Coastguard received a 999 call, reporting an overturned dinghy with 2 people waving on it, off Golden sands camp, Towyn, some 3 miles to the west of Rhyl. The local coastguard team were also tasked. The crew were already at the boathouse, having just put the boats back after a publicity event in the events arena at the side of the boathouse. The boat was launched within 4 minutes and proceeded to the spot, guided by the mobile which was with the first informant. It was found to be the Kinmel Bay inner sewer buoy, with 2 cormorants drying their wings on the top, and so all units were stood down and returned to station by 1530. ILB crew paged to go to the assistance of a woman who had gone into the sea off Pensarn ,Abergele, to retrieve her dog who was swimming out. The crew assembled but were called back as the boat was coming out of the boathouse as the coastguard were told the woman was back out of the water and the dog was safe. ILB ready for service by 2100. Classed as standby only. ILB crew paged after members of the public dialled the Coastguard to report a youth fully clothed, swimming in the River Clwyd at the entrance to Rhyl harbour. The ILB launched within 5 minutes and found the youth on the opposite bank of the river, soaking wet and shivering, with the first signs of hypothermia. He was wrapped in a blanket and given a wetsuit hood to wear, and was transferred to the ILB. He appeared confused and incoherent and could not answer questions properly. He was taken across the river to the coastguard mobile unit, and was then taken to hospital by ambulance. The ILB returned to station by 2030. The local coastguard had been alerted the previous night to a 20 foot yacht anchored off the promenade at Rhyl, with just a small light on the forestay. The boat seemed to be OK and so the unit was stood down. However, when dawn broke, the yacht was high and dry on the beach, and the lone occupant was seen walking on to the promenade. he returned to the boat, and waited for the incoming tide. When the boat started to float, Holyhead coastguard contacted the man by mobile phone, as thy had received numerous 999 calls from the public, who were worried about the position of the yacht. At 1100, the owner requested assistance and the ILB was launched within 1 minute, as a crew had already been phoned to stand by. The ILB was alongside the boat within 2 minutes, and 2 ILB crew went aboard the yacht. It transpired the man was going from Southend to Glasson Dock in Fleetwood, but decided to anchor off Rhyl as he was out of his medication, and was suffering from flu and had had no food or drink for a number of days. The crew attempted to start the engine, and succeeded after a number of attempts. The boat was then taken by the ILB crew with the ILB standing off, into Rhyl harbour, and put on a mooring. The owner was checked over by an ambulance crew, but refused to go to hospital. He now intends to stay in Rhyl harbour for a few days, and then complete his journey. The ILB crew were released and returned to station by 1225. ILB launched with AWB to investigate report of speedboat off Llanddulas with apparently no-one on board. Persons found on boat all OK, and fishing. Both boats then returned to station by 1400. Rhyl Beach Guard requested the back up of the ILB to assist their beach guard who was helping 2 members of the public trying to get a dinghy with 2 children on board back to the beach, but were having difficulty getting back due to the incoming tide and offshore breeze. The ILB launched but the combined efforts of the adults had succeeded in getting the dinghy to a position where they could stand up, and so no help was necessary. The ILB recovered, then took the children back to their parents . the ILB was ready for service by 1610. ILB launched to assist the 3 crew on board 18 foot long yacht “Hanna Marie” which had sailed into the surf line off Golden Sands camp, Towyn, and was in difficulties. The ILB crew went alongside and took off the wife and child of the skipper, who were both seasick. The 2 were handed over to the Coastguard mobile patrol on the beach. Ambulance personnel were on hand, but the 2 did not require hospitalisation. The ILB crew returned to the yacht and managed to get a tow line on board and tow it out to deeper water off Rhyl. It had been decided to transfer the tow to the offshore lifeboat and this was done at 1318. The ILB returned to station by 1330. See AWB report for more detail. The ILB was ready for service by 1345. ILB and Coastguard were paged after a member of the public contacted Holyhead coastguard reporting clothing on the beach at Sandy Cove, and an upturned boat out to sea. The ILB was on scene within 7 minutes, and the coastguard mobile from Rhyl at virtually the same time. The first informant was contacted and pointed out the upturned boat. This was discovered to be the Towyn Inner sewer buoy, which was lying on it’s side and covered with bird droppings, making it look like a white-hulled upturned boat. the clothes must have been washed away with the incoming tide, and no-one was reported missing. All units were therefore stood down, the ILB returning to station at 1915. The 2nd Coxswain and the mechanic were at the boathouse and noticed 2 children cut off by the incoming tide off the Suncentre at Rhyl. The beach guard were already involved in another incident and so the crew went down to the water’s edge with the county tractor and the Landrover. The mechanic used the Landrover’s Tannoy loud hailer to attract the children’s attention, as they were on the third bank out and the water was too deep to take the Landrover in. the 2nd Coxswain then took the County tractor through the water to the sandbank and managed to assist in recovering the children to the shore. They were taken back to the boathouse in the Landrover and were checked over and they returned to their family cold but unharmed. the vehicles were back on station by 1320. The crew were at the boathouse for their normal Sunday morning meet, and the pagers were set off for the ILB to assist shore units searching for a missing 6-year old girl off the Skytower at Rhyl. The ILB was just going down the ramp on to the beach when they were notified that the child had been found safe, and the ILB returned to station by 1142. Numerous members of the public had reported a black object in the water off Golden Sands camp, Towyn. The ILB crew were paged and launched within 4 minutes. The journey to site took 7 minutes. The ILB began to search for the object, and came across a large tyre. It was retrieved and the people on shore confirmed that this was the object they had seen. The ILB returned to station at 1510. An 18-feet long yacht with 2 persons on board, called “Mayday” because they had gone across the revetment wall marking the entrance to Rhyl harbour, and had caught up on a post. The Lifeboat Operations manager consulted Holyhead Coastguard, as a crew had assembled, and put the ILB on standby. However, the skipper of local fishing charter boat “Jensen” had also heard the “Mayday” and went to the boat’s assistance, helping them to regain the river channel and find a safe mooring in Rhyl harbour. The ILB was therefore stood down at 2140. It was reported to the boathouse that a small dinghy with an outboard on it, was drifting about 2 miles out from the boathouse. The crew could not readily identify if anyone was on board, and the coastguard were consulted, who requested the ILB launch to investigate. The boat launched and came across an 8 foot dinghy, with an oar and outboard, with no-one on board. As the engine was in the down position, a search was commenced, with Holyhead Coastguard requesting AWB back-up, together with helicopter assistance from Rescue 122 from R.A.F. Valley. As the units were searching, a man approached the Rhyl mobile coastguard team to say that it was his dinghy, and had come adrift the night before from Rhyl harbour. All units were stood down apart from the ILB, who towed the dinghy back to Rhyl, returning to station at 1220. The ILB crew were paged following reports of 2 children in a small dinghy being blown offshore at Pensarn, 4 miles to the west of the station. A crew was already at the boathouse, and so the boat was launched in 2 minutes. The council beach patrol boat was also requested to go to scene as it was also reported there was a man swimming out to the dinghy. The beach patrol got to the dinghy first and took the 1 child on board, the other child had managed to get ashore with the swimmer’s help. the ILB went immediately to the beach where a crowd had gathered around the man, who was suffering from hypothermia. The crew assisted him into an ambulance, and made sure the other children were OK after the beach patrol brought them ashore, then returned to station by 1420. ILB requested to launch after a member of the public reported a dinghy 1/2 mile out from Pensarn , there appeared to be no-one on board, when he had seen 2 children on board previously. the ILB launched and was supported by the AWB and the rescue helicopter Rescue 122 from R.A.F. Valley, Anglesey. A search was commenced and carried on for about an hour when the children’s mother approached the Coastguard mobile patrol on shore and confirmed the children were safe ashore after abandoning the dinghy. All units were stood down at 1840. (PART 1) Concerned members of the public dialled 999 regarding the position of a 20-foot yacht ” MARIDADI”, with 1 person on board, which was ashore at the beach opposite the Nova centre,) Prestatyn. The owner was sailing from Fleetwood to Beaumaris, and was about 15 miles south of any straight line between the 2 locations. he was looking for a fuel bunker and had no idea that Rhyl had a harbour. The yacht was at anchor but was inside the surf line with the tide receding. The ILB launched and went alongside the yacht, and attracted the man’s attention. He said he didn’t need any help, and refused to talk any further. The Helmsman of the ILB tried to inform the man he could be in a dangerous position when the tide came in again, but the man refused all offers of help and the ILB crew had no alternative but to return to station by 2134. (PART 2) ILB crew paged after the same yacht radioed the coastguard requesting assistance that he could not get off the shoreline as his outboard engine was not powerful enough to get off the beach. The ILB launched and got a towline on the yacht, and it took all the power of the ILB to pull the yacht off the beach and into deeper water. The skipper of the yacht then said he could get to Rhyl under his own power, and the tow was slipped, but the yacht was making little headway against the tide. As the tide was ebbing and the harbour at Rhyl was not accessible except for 2 hours either side of high water, the skipper was persuaded to take up the tow again, and succeeded in getting to Rhyl harbour where he was safely moored up. the ILB returned to station by 08.00. ILB launched together with AWB after the local fishing boat “Lowri” put out a MAYDAY call. one of their 3 crew was in Rhyl harbour after the dinghy he was in was capsized. The ILB crew picked him up from the water’s edge in the harbour and transferred to an ambulance. His colleagues were taken on the AWB. Both boats returned to station by 0130. Rhyl Beach patrol reported an 11-year old boy was lost and was last seen in the water. The ILB was launched to search from the sea, and the Landrover and County tractor, together with coastguards and the beach patrol. He was found at the water’s edge by the Landrover team and returned to his parents. The ILB returned by 1645. All units tasked again to search for a 5-year old girl also seen last at the water’s edge. She was found by the beach patrol Lifeguards and the Lifeboat was ready for service by 1710. The start of a very busy day for us. Offshore breeze, glorious sunshine, and an ebb tide. It must be noted, however, that people seem to be getting more responsible with their dinghies, keeping them tied to a line ashore or in a parent’s hand, and not going out too far, but there are still many who do not heed the sea safety advice. White inflatable dinghy off Pensarn, Abergele, coastguards couldn’t make out whether anyone on board, so ILB launched. They caught up with the dinghy, but there was no-one on board. After a quick pass on the shoreline to see if anyone tried to call them, the ILB returned to station by 1435. Inflatable with 2 children off Pensarn again, with the father swimming out to them. ILB were already at the station, so ILB launched within 3 minutes. Before the boat could get to the scene, it was reported to the coastguard that all 3 were now safe on shore, so the ILB was stood down and returned to station by 1700. Rhyl Beach patrol requested assistance from the ILB Landrover as they had 2 lost children at the same time. The crew went to the beach patrol hut and had just arrived when it was reported that the children had been reunited with their parents, and the crew returned to the boathouse by 1721. ILB requested to launch for another inflatable dinghy off Golden Sands Holiday camp, Towyn. They had just launched when it was reported the inflatable had been brought ashore, but just as they were turning back, the Coastguard asked the ILB to go to Gronant, about 5 miles East of the station, to assist the police in looking for an 11-year old autistic boy missing on the beach. The Landrover with additional ILB crew and Coastguards were also tasked to the incident together with Rhyl coastguard mobile. They arrived on scene to find that the boy was in the custody of the camp security guards and all units were stood down, being ready for service by 1830. ILB taken to harbour to launch to assist Police officers apprehend a man who had jumped off the Blue bridge in Rhyl harbour. He had climbed aboard a boat in the middle of the harbour and was threatening to fire a flare at anyone who approached him. The ILB crew stood by to ferry armed police officers to the boat, but eventually the man’s friend persuaded him to wade ashore and give himself up to the police. The ILB was stood down and arrived at station at 0400. The AWB was on standby for the job but due to low water levels in the harbour, was not used. The coastguard called the ILB to tell them there was another inflatable off Pensarn, 2 miles to the west of their position, and so they went to this inflatable, again no-one on board , so both the ILB and coastguard mobile patrol conducted a slow sweep either side of the shoreline to see if anyone would attract their attention regarding the dinghies. The coastguard and boat were contacted by members of the public to confirm there was no-one on the dinghies when they were being blown out to sea, and so all units returned to station by 1600. The ILB was just launching with 2 film crew from ITV London on board to do a clip for the national news on sea safety at 6 pm, when Holyhead coastguard requested they proceed to Penrhyn Bay, some 12 miles to the West, to investigate reports from people who had dialled 999 regarding an overturned dinghy. Llandudno mobile coastguard was also tasked. The ILB was just off Colwyn bay with 3 miles to run when the coastguard mobile reported the object was a log with a branch sticking up, and so the ILB was released to continue filming. I will try to get a video link here soon. The ILB returned to station at 1500. There was a crew available at the boathouse when Holyhead Coastguard requested the ILB to launch to investigate an inflatable dinghy 1.5 miles North of the boathouse. the crew were on scene within 5 minutes and found the inflatable with no-one on board. A quick search of the area revealed no sign of any swimmers and so the ILB returned to station at 1435. It was Rhyl Flag Day and the ILB and the AWB were in the events arena for the day. The first call was not long in coming, as it was a beautiful sunny day, offshore breeze and incoming tide. The ILB first launched to 1 child in an inflatable dinghy off Golden sands Holiday camp. A quick search of the shoreline was made to check if there was no-one on the inflatable, and the coastguard patrol were informed by the parents that the child was safe ashore. The ILB returned to station at 1415. ILB launched to assist Rhyl beach guard with 2 inflatables off the entrance to Rhyl harbour. the beach guard boat got one, and the ILB picked up another with 2 children in it and returned the children to the shore. ILB launched to assist speedboat with 3 people on board, who had hit the rock groynes off the Nova centre. The ILB had just launched when they were informed the boat was on the rocks but no assistance required as the persons were safe ashore, so the ILB returned to station by 1820. The crew were washing down the ILB when Rhyl coastguard patrol contacted Holyhead coastguard requesting ILB to the previous incident as the boat was still on the rocks and people were still on it. The ILB re-launched and the crew successfully got the speedboat off the rocks and towed it and the passengers to the nearest slipway at Barkby beach, where the boat had launched from. The ILB and AWB were on display at the Rhyl events arena. It was a sunny day, with an incoming tide and offshore breeze, typical of the start to a busy day. Holyhead Coastguard requested immediate launch of ILB to a dinghy with 2 children in it being blown out to sea at Golden sands Holiday camp. the occupants had come out of the dinghy and were trying to swim ashore. The AWB was also put on standby. When the ILB arrived on scene, 1 person was on the rocks and 1 person had made it back to the beach. the ILB got to the person on the rocks and took him off. He was suffering from hypothermia and was shivering and confused , lapsing out of consciousness, as he had been in the water 20 minutes. The ILB transferred him to Pensarn beach to transfer him to an ambulance to go to hospital. The dinghy was retrieved and the ILB returned to station by 1240. The coxswain and the Lifeboat operations manager were at Splash Point at the end of Rhyl promenade and noticed 2 dinghies being blown out to sea, and 2 people swimming in the water. 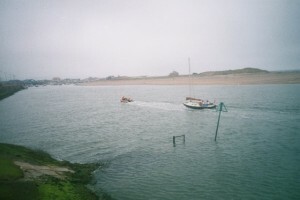 the ILB was diverted and proceeded to the site. the children had made it ashore under the watch of the coxswain and the ILB recovered the dinghies, returning to station by 1410. ILB requested to launch to carry out a shoreline search together with the beach guard and Rhyl mobile Coastguard patrol to search for an 11-year old boy with learning difficulties who had been seen on the Lifeboat previously, but was now missing. after about 6 minutes the child was found safe and well by the Lifeboat in the events arena and the ILB returned to the display by 1500. ILB launched to request of Holyhead Coastguard to investigate an inflatable dinghy off Golden sands Holiday camp, Towyn. The ILB found the dinghy with no-one on board, and after a short search, returned to station by 1330. ILB and coastguard units paged to investigate cries of help from a boat moored in the middle of the harbour. The ILB crew found 3 children aged 9 to 12, on a small fishing boat. they were playing on a small rowing dinghy when the youngest fell out. He could not swim, and so the elder girl jumped overboard to save him, and the 3 found themselves clinging to the dinghy. they managed to make it to the fishing boat and scrambled on to it. The ILB picked them up and took them to the yacht club slipway . the young boy was given oxygen and warmed with a blanket as he was very cold. the 3 were transferred to an ambulance, the youngest in a stretcher, and taken to hospital. The ILB returned to station at 1825. The crew were just putting the ILB away from the previous shout when the coastguard asked them to investigate an inflatable dinghy 2 miles out from Kinmel Bay. They launched again and came across a 6ft dinghy with no-one on board. A quick search was undertaken with nothing found. The ILB then investigated a small dinghy with 2 men on board also off Kinmel Bay, as people ashore were concerned for them. the 2 men were adequately equipped with safety equipment and an outboard engine, and were happily fishing. The ILB then returned to station by 1925. ILB launched to report of inflatables being blown out to sea off Golden Sands Holiday camp. Rhyl Beach guard boat also launched . Each boat took 1 inflatable. Found no-one on board. both boats then returned slowly to station, close inshore, to see if anyone attracted their attention., this did not occur, so the boats returned to station by 1520. While the boats were off station, the boathouse crew noticed 11 people cut off by the tide off the promenade at Rhyl. The Beach patrol boat was recalled to Rhyl, and the beach guard on their Quad bikes, the beach guard controller, and some of Rhyl crew in the Landrover LR46, went to the shore to help. Rescue helicopter 122 was nearby and also was on scene. 8 people were transferred to the beach guard boat, and 3 people were picked up by the Landrover which had gone into the water to assist. all 1 people were then put in our Landrover and returned to the promenade. 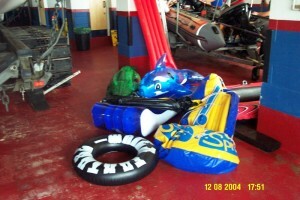 ILB re-launched to 2 inflatables off Golden sands Camp, Towyn, the beach guard was also alerted. The inflatables were picked up, but there was no-one on board. as before, the boats returned to station slowly to see if anyone alerted them, but there was nothing. the local Coastguard mobile patrol was also on scene, but no-one approached them either. The ILB returned to station at 1550. The ILB crew had just arrived at station when a young girl approached them to say her grandmother was unwell near the boathouse. the lady said she was having an angina attack, and had taken her medication but to no avail. An ambulance was called and the crew administered oxygen on scene. The lady was actually having breathing problems and she was taken to hospital. The crew were assembling for an AWB exercise when they spotted 4 adults and a child in a pushchair, being cut off by the tide off the boathouse. The ILB was taken across the gutter to the group and they were brought back to shore. ILB returned at 1820. ILB launched at request of Holyhead Coastguard to investigate 2 children in an inflatable off Golden sand Holiday camp, Towyn. They were picked up by the crew and returned back to their parents on the beach. They were just returning t Rhyl when at.. The ILB was told to return to Golden sands as another inflatable with 3 children on board was reported being blown out to sea. The crew picked them up and again returned them to the beach. The crew returned to station by 1410. ILB launched once again to Golden sands as there were numerous dinghies being blown out to sea. They were all recovered and as usual, the ILB made a slow shoreline run back to station to see if anyone attracted their attention, but with no result. ILB returned to station by 1625. Rhyl Coastguard requested the ILB to launch to 2 adults in an inflatable, struggling to get back ashore off the boathouse at Rhyl. The ILB was just coming out of the boathouse when the crew saw the people were nearly ashore. They were interviewed by Rhyl Coastguard mobile patrol who ascertained that the had been trying to get to shore for over 20 minutes. They were very lucky. ILB crew was stood down at 1755. ILB launched after a member of the public reported concern for a cabin cruiser off Rhyl, which appeared to be drifting, about 1 mile off the boathouse. The ILB came alongside the 18-foot Princess cabin cruiser “Lady Christine”. There were 3 adults and 1 child aboard. the ILB escorted the boat as they started the engine, but it soon was obvious that all was not well, as clouds of smoke came out of the engine compartment. the engine was overheating. the boat carried on at slow speed and made it to the bottom ferry point outside Rhyl harbour, but then they couldn’t go any further. The AWB was requested to take the boat in tow. This was done and the ILB assisted the AWB in getting the cruiser back on to a mooring in Rhyl harbour. Both boats returned to station by 2230. see AWB report for video footage. ILB crew paged to investigate report of inflatables being blown out to sea off Kinmel Bay. ILB found a ring and a ball, A quick search of the beach nearby produced no-one trying to attract the ILB or the coastguard mobile’s attention and so the ILB returned to station by 1620. ILB again launched to reports of inflatable being blown out to sea off Knightley’s funfair, Towyn. ILB found 2 more rings with no-one on board, a quick search produced nothing, and the ILB returned to station at 1720. ILB crew paged after Rhyl coastguard reported persons trapped on a sandbank off the end perch at Rhyl. The Landrover was used to go down the beach and a boy and girl were picked up and recovered to the boathouse, safe and well. All completed by 1915. Rhyl coastguard again reported persons trapped on the sandbank at nearly the same point. 11 persons in all. Landrover was again used and 3 people were picked up by the Landrover and taken to the promenade. They were completely unaware that the tide was coming in and the gutter behind them was filling up rapidly. The Landrover returned to station by 1935. Rhyl beach guard reported to Holyhead coastguard they could see an inflatable off Kinmel Bay . The ILB launched and proceeded to the area guided by the local mobile Coastguard patrol. The ILB picked up an inflatable dinghy and a rubber ring and returned them to the beach. A member of the public came to the crew and said they had seen 2 children in the dinghy at 14.30. Holyhead Coastguard then asked for back-up with the AWB; rescue 122 helicopter from RAF Valley Anglesey; and the North Wales Police helicopter. Nothing was found for 2 hours, and the search was called off. No-one was reported missing, and it was assumed the children had got off the dinghy before it was swept out to sea. the ILB returned to station at 1745. Yet another inflatable off Golden Sands holiday camp, Towyn. No-one on board. quick search, but no-one attracted the attention of the crew from shore. ILB returned to station by 1455. The crew were already at the boathouse as the AWB was out on service, when they noticed a jet-skier hit a large wave off the Skytower at Rhyl, come off his machine, and the machine come down on top of him. the ILB crew assembled and they went to the shoreline. The skier was shaken but unhurt, and the crew assisted the beach lifeguards in recovering the jet ski back to the boathouse. the crew and ILB was ready for service by 12.30. Rhyl Beach guard reported to Holyhead Coastguard that 2 of their lifeguards at Prestatyn had entered the water after 2 children in an inflatable were being swept out to sea off Prestatyn. The one child was known to suffer from asthma, and the ILB was immediately paged. The crew were on their way within 4 minutes and were on scene in 11 minutes. The 2 lifeguards had reached the dinghy, and had managed to get it closer to shore when the ILB arrived. All 4 were put on board the ILB and returned to the shore to the coastguard and ambulance. The lifeguards were Ok after their work, and the children were suffering from hypothermia. The ILB returned to station by 1710.This was a great example of the close co-operation and teamwork that exists between the R.N.L.I, Coastguards and Beach Patrol in Rhyl. The ILB proceeded to assist the AWB which was towing yacht “Linda Mary” to Rhyl. Once inside the harbour entrance, the tow was transferred from the AWB to to ILB to take the yacht to the quay wall, with 2 crew on the yacht from the AWB and the 2 casualties on board. As the casualties were transferring from the yacht on to dry land, 1 of the men fell overboard and so the ILB crew helped him back on board. the man had one lung and other conditions, and so an ambulance was called for. Once the man was in the ambulance, the ILB returned to station by 1730, and the 2 crew from the AWB were brought back to the boathouse by the local coastguard mobile patrol. Holyhead Coastguard requested ILB to launch to Prestatyn to assist a jet-skier who had broken down. As the crew were getting to the water’s edge it was reported that 2 people had swum out to the jet skier and the 3 had managed to get back to shore, so the launch was cancelled. The ILB returned to station at 1945. The mechanic spotted 2 people cut off by the tide off the boathouse. He contacted Holyhead Coastguard who asked him to go to down to assist the people as the beach lifeguards had now finished for the season. He drove the Landrover down to the water’s edge and assisted the people back to the shore. He then returned them to the promenade, returning to station at 1325. Holyhead Coastguard paged the ILB and the coastguard mobile to go to Kinmel bay to assist 2 persons cut off by the ride again. The coastguard mobile got to the scene before the ILB could launch and confirmed all persons were now safe ashore. The ILB was stood down and returned to station by 1358. Both ILB and AWB were launched to search for a 5-year old girl reported in the water face down off Towyn. Police and RAF rescue helicopters and local coastguards were also tasked. The ILB encountered gusts of wind up to 30mph and with 2m high seas, so the AWB was also launched. After 2 hours, the coastguard at Holyhead scaled down the search as nothing had been found, and it was highly unlikely that a person could survive in those seas for long. A shoreline search by the coastguard was kept on, but nothing was found. The ILB returned to station by 1500. ILB crew paged to assist the crew of the pleasure boat “Scorpion” who had anchored their boat at low water and come ashore. The tide was now flooding and the owner could not get aboard. the anchor was also dragging and so the ILB crew took the skipper on board and transferred him to his craft.. 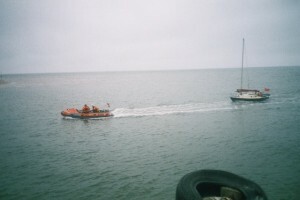 The engine of the boat was also not working properly, and so the ILB towed the boat into Rhyl harbour ,put it on a mooring, and transferred the skipper back ashore. the ILB returned to station by 2150. The ILB crew were paged to attend to reports of children in difficulty off Kinmel Bay. Immediately after the pagers were activated, the coastguard reported all were safe ashore, and so the launch was cancelled. Classed as stand-by. ILB paged for immediate launch to assist police at Kinmel bay. A male had entered the water and had started swimming out to sea. ILB launched within 4 minutes and was on scene within 5 minutes. The man was static in the water about 300 metres out and was taken aboard the ILB, suffering from severe hypothermia and was slipping out of consciousness. The man was wrapped in a blanket, given oxygen and taken back to the shore. The ambulance and coastguard mobile teams were unable to get to the water’s edge, so the ILB crew decided to take the man back to the boathouse, where the ambulance crew were diverted to, and the man was transferred to Glan Clwyd hospital. The ILB was ready for service by 1458.